This article is about the institute of higher education in Texas. For other schools named University of St. Thomas, see University of St. Thomas (disambiguation). The University of St. Thomas (also referred to as UST or St. Thomas) in Houston, Texas, United States is a comprehensive Catholic university. Founded in 1947 by Basilian Fathers, it serves as the only Catholic university in the Archdiocese of Galveston-Houston. It is endorsed by The Newman Guide to Choosing a Catholic College. On June 24, 1944, the Bishop of the Diocese of Galveston, Christopher E. Byrne, entered into an agreement with the Houston-based members of the Congregation of St. Basil to found a co-educational Roman Catholic university in Houston "as soon as practicable after the War, if possible by 1947." The Basilian Fathers had previously started several other secondary schools, as well as institutions of higher learning, throughout Texas in the early 20th Century, including St. Thomas High School, also located in Houston. The first classes at UST began on September 22, 1947 with 57 freshmen and 8 faculty members. UST graduated its first class on May 31, 1951. In addition to the Basilian Fathers on staff, there are also several Franciscan Sisters of the Eucharist who reside in the convent on campus. The University is named after St. Thomas Aquinas. Originally consisting solely of the Link–Lee House on the corner of Montrose and West Alabama, the University has expanded towards the South and West over the last 60 years, establishing itself as a notable landmark in Houston with over 20,000 graduates. The current expansion plan includes the acquisition and development of the majority of the land comprising 25 city blocks. Former University President J. Michael Miller, C.S.B. was appointed on November 25, 2003 by the Pope to preside as Secretary of the Congregation of Catholic Education. By virtue of this office, Miller was elevated to Archbishop by Pope John Paul II on January 12, 2004. The University of St. Thomas is located in the Montrose neighborhood of Neartown. The campus borders Houston's Museum District and is adjacent to the Menil Collection and the Rothko Chapel. Many of the University's offices are in houses built in 1930s that are scattered throughout campus. Some of the buildings are historic including the Link–Lee House. This was once the largest home in Houston. It contains the University's executive office. The Theology department is located in the childhood home of Howard Hughes. The campus is arranged in a square format, with the main focus of buildings on the north side of the campus which is called the Academic Mall. Composed of rectangular buildings, the Academic Mall is the symbolic architecture of Philip Johnson. On the south end of the Academic Mall is the Doherty Library. The Chapel of St. Basil is located at the opposite end. Four structures flank these two buildings on each side in a rectangular formation surrounding a courtyard. The setup is designed to display the methods of human knowledge (faith, represented by the Chapel, and reason, represented by the library) in dialogue regarding the various subject matters. The Chapel of St. Basil is the main location of Catholic worship on campus. The Chapel of St. Basil is a unique work of art that has won many awards for its architecture. Basil was a fourth-century bishop who was a proponent of both education and the monastic life. The Chapel sits at the north end of the Academic Mall, representing faith in the Academic Mall's artistic depiction of faith and reason balanced in dialogue. There is no artificial light inside the main section of the building during the daytime. There is sufficient sunlight to fully light the worship space, as a combination of smooth textures and reflective surfaces maximize all light shone in the building. At night, the lights from outside combined with candles inside the Chapel are more than enough to illuminate the worship area. The entry to the outdoor narthex of the Chapel is created with a tent-like flap extending over the entry, creating an enclosed space that is still outdoors. The architecture also shifts the focus the building: the entrances to the Chapel face away from the center of the building and towards the tabernacle to remind all who enter that the central point of the Chapel is not the altar or the crucifix, but the location of the Eucharist. During the 2005-2006 school year, the Gueymard Meditation Garden was built on the west side of the Chapel. The garden features three fountains, representing the persons of the Trinity, and benches for reflection. It also includes a replica of the labyrinth in the Cathedral of Chartres in France. Seen from above, the four arms of the pattern stand out as a clear image of the cross of Jesus Christ. Completed in September 1972, The Robert Pace and Ada Mary Doherty Library (located at the southern end of the Academic Mall) is one of the premier research libraries in Houston. It houses over 250,000 books, 80,000 periodicals, and 150 databases. The University currently maintains a population of 1,609 traditional undergraduate students and 1,973 graduate students. Adding to this number are non-traditional, off-campus, study-abroad, special program, and seminary students that bring the grand total to 3,582 students. UST has many diverse ethnicities, as 61% of the total number of students are African-American, Hispanic, Asian/Pacific Islander or American Indian. UST also maintains a student body that is at least 25% Hispanic. The Hispanic Association of Colleges and Universities rates UST as an Hispanic-serving institution; it is the only private institution of higher education in Houston to earn this rating. 58% of the total enrollment is Catholic. University students come from 40 states throughout the U.S. as well as 54 countries around the world. For the 2013-2014 academic year, undergraduate tuition is set at $930 per credit hour. Total estimated cost of undergraduate tuition and fees is $28,240 for one year (30 credit hours). Room and board is $8,250 for one year. With books and a new-student fee of $200 added, the total cost is about $38,190 a year. Graduate tuition for the 2013-2014 academic year is $1,040 per hour. For one year of graduate school (18 credit hours) with fees added, total tuition is about $18,720. 86% of first-time freshmen receive financial assistance for their undergraduate education at UST. The University awards nearly $37 million in financial aid annually, including $13.7 million in UST-funded scholarships and grants. Upon admission to UST, students are automatically considered for a scholarship, ranging from $7,000 - $16,000, using information from admissions applications. Scholarships are based on high-school GPA, class rank, and SAT/ACT scores. The University awards a few select students full tuition scholarships annually. The V.J. Guinan Presidential Full Tuition Scholarship is open to Catholic students that meet specific academic requirements. Recipients are required to join UST's Presidential Ambassadors and be active in Campus Ministry. UST offers several special programs within its curriculum, consisting of undergraduate degrees, graduate degrees, and special preparation programs. The Philosophy Department of the University of St. Thomas offers masters and doctoral degrees in Philosophy, specializing in the thought of St. Thomas Aquinas and his commentators. In addition, professors in the department publish works on Thomist philosophy in conjunction with the University of Notre Dame Press. The University offers a strong pre-health undergraduate program with a liberal-arts foundation. Graduates experience high interview and acceptance rates at medical and dental schools. Advisors are very involved, from the First Year Experience to preparing for the MCAT or DAT. UST offers pre-dental, pre-medical, pre-optometry, pre-pharmacy, pre-physical therapy, pre-physician assistant and pre-veterinary medicine. In engineering, the University has cooperative agreements with Texas A&M University, the University of Houston, and the University of Notre Dame. Students earn a BA degree in mathematics from UST and a BS degree in engineering at the cooperative institution. During the three years at UST, students complete an individualized plan of study that combines a broad liberal-arts background with the prerequisites for the program at the chosen school. The UST cooperative engineering program has a 100% acceptance rate. Much like the pre-health professional programs, the pre-law program is not a major in itself, but an additional program which can be combined with any major. Pre-law students enroll in required pre-law courses that help prepare for the Law School Admissions Test (LSAT), Socratic examination, and case briefing. To support UST students in applying to law school, the University participates in a cooperative admission program with South Texas College of Law. The CBE also hosts the Women in Business Forum and the Business Ethics Society; it is the signature program of the Amom Foundation, a non-profit organization founded by a Cameron School of Business MBA alumnus; and it participates in the annual President’s Day of Service. Learn more at www.stthom.edu/cbe. At the undergraduate level, the School of Education offers programs in general education (from pre-K through high school), bilingual education, and exceptionality. In addition to its undergraduate programs, the School of Education offers several masters level programs. One such program is directed towards Catholic educators. Following their undergraduate career, students enter into a two-year rotation in a masters program in conjunction with the University's Gulf Regional Academy of Catholic Educators (GRACE) program. Over the two years, students live in community as they learn skills needed in the classroom. All students are given a two-year teaching job for practical experience, which can become a permanent job during the school term following their completion of the program. UST also offers programs for teacher certification. Transition to Teaching allows students with a bachelor's degree to complete a few graduate classes to teach in Catholic or public schools. All Transition to Teaching classes can be used as part of a graduate degree upon completion of formal graduate admission. The UST Department of Fine and Performing Arts and the Glassell School of Art at the Houston Museum of Fine Arts collaborate in offering BA and BFA majors, a minor, and elective courses in Studio Art. This joint effort gives UST students access to the resources of the Glassell School and to instruction offered by the artists on its faculty while receiving credit at the University towards a degree. The Mendenhall Achievement Center, established in 2008, provides a professional support team to assist students in achieving their goals while enrolled at UST. Services include advising, mentoring, tutoring, and counseling. Additionally, the Mendenhall Summer Institute is a five-week program that allows incoming freshmen to complete six credit hours before their freshman year. The Institute for International Education Exchange has consistently ranked UST as one of the top 20 master's schools in the United States for study abroad participation by undergraduate students. Approximately 8% of its undergraduates choose to study abroad for a semester, compared to the national average of 2%. UST's athletic teams, nicknamed the Celts, are part of the National Association of Intercollegiate Athletics (NAIA), primarily competing in the Red River Athletic Conference (RRAC). Men's sports are basketball, golf, and soccer; women's sports are basketball, golf, soccer, and volleyball. In Fall 2006, the NAIA informed UST that its application to join had been accepted, bringing varsity intercollegiate athletics back to campus for the first time in 20 years. Beginning in 2007, UST fielded both a women's volleyball team and a men's soccer team to compete as members of the Association of Independent Institutions (AII). The 2009-10 academic year marked the inaugural season of the UST men's varsity basketball team. On February 14, 2018, UST announced it would become the Southern Collegiate Athletic Conference's 10th member after completing an exploratory year in NCAA Division III. Pending acceptance into Division III, SCAC competition would begin in the 2019-2020 season. As Division III and the SCAC require a minimum of 12 sports, UST will add men's and women's tennis and baseball during the 2019-2020 academic year. The University has two types of campus housing, both under the direction of Residence Life. Guinan Residence Hall is a three-story, 306-bed facility with private double-occupancy rooms. It is located near the Moran Parking Center and Crooker Center and provides a residential experience focused on community living. Young Hall, located on the south side of campus, offers apartments to upper-class students and graduate or adult students who want to benefit from a Residence Life community. An annual tradition dating back more than 50 years is the "Neewollah" Party (Halloween spelled backwards), held every year in October. Hundreds of students dress up in costume and party on campus as various local bands and DJs provide music. Students compete for prizes in costume and dance contests. The event draws about 600 people and is held on Crooker Patio, a large area in front of the University's dining hall. The Student Organizations Committee is a collective of student leaders from five major organizations that oversee many areas of student life. There is no presiding officer of the SOC. All SOC members have an administrative or faculty adviser. SOC members are allowed to petition for operating budgets before other organizations and/or clubs can request funds for the following school year. The Student Government Association is the legislative student body at UST. The senate body consists of up to four representatives from each class (freshman, sophomore, junior, senior, and graduate) who are elected into office. An executive board led by an elected president and an elected vice president oversee the SGA. The SGA president can appoint a secretary, treasurer, historian, parliamentarian, and webmaster. The SGA's main function is to allocate funds collected by the Student Activity Fee. It holds regular meetings every Tuesday in the Council of Clubs meeting room in Crooker Center. The Student Activities Board is the main programming organization at UST. SAB is led by an elected president and an elected vice president. It is responsible for planning traditional events like Neewollah and Spring Formal, as well as occasional open mic and monthly bingo nights. The Council of Clubs is an umbrella organization that represents clubs on campus. It is led by an elected chair and an appointed vice chair. The COC provides funding for various clubs at UST. Interested clubs may request membership into the COC and may be approved with a simple majority vote by eligible clubs, called the board of directors. The Sport Clubs Associations is responsible for the sport clubs on campus. It is led by an elected president. Like the COC, it is an umbrella organization that funds athletic-oriented clubs and teams at UST. The Graduate Student Association is responsible for representing and catering to the graduate students of UST, which make up about 55% of the student body. In addition to helping integrate graduate students with the campus, it provides independent programming open to both graduates and undergraduates. The University acknowledges 82 student organizations, most of which fall within SOC jurisdiction, but other organizations are overseen by other departments of the University. Honor Societies and Academic Clubs are often overseen by their departments, but some seek SOC approval for financial purposes. Other organizations are under the directorship of administrative offices such as Campus Ministry. Others include the Knights of Columbus, Catholic Daughters of the Americas Court of St. Macrina, Legion of Mary, and over 20 department-run honor societies. In 2009, the UST Knights of Columbus were rated among the top 3% of college councils in the United States. The Summa, founded in September 2008, is the newspaper serving the UST community. The Summa is led by a student editor-in-chief as well as various section editors and staff members. The staff is responsible for producing the paper, which is published on the first and third Thursdays of every month during the fall and spring semesters. Laurels literary magazine publishes poems, short fiction, and other creative writing submitted by enrolled students. It is led by three appointed editors. During the fall, the three editors are responsible for the administration and editing of the issue. However, a curriculum-approved Literary magazine class, in cooperation with the editors, is responsible for the spring issue. Thoroughfare magazine is the newest publication on campus. Modeled after The New Yorker as a "features" magazine, it highlights students, organizations, events, places, and local occurrences in Houston. It is led by an appointed student editor-in-chief with the help of a student staff. Sean Patrick Flanery c.1985 - actor (The Boondock Saints, Powder, The Young Indiana Jones Chronicles), instructor of Brazilian Jiu-Jitsu, and author. Marshall Applewhite Chair of the Music Department from 1965-1970, founder of the Heaven's Gate cult. ^ "University of St. Thomas". Retrieved 1 April 2015. ^ a b "Aquinas College (Tennessee) - Student Life - Best College - US News". Retrieved 1 April 2015. ^ "BYRNE, CHRISTOPHER EDWARD (1867-1950)". Texas States Historical Association. ^ "NOLD, WENDELIN J. (1900-1981)". Handbook of Texas Online. ^ a b "UST 2006-2007 Fact Book". Retrieved 26 March 2018. ^ "- Texas State Historical Association (TSHA)". Retrieved 1 April 2015. ^ David M. Cheney. "Archbishop John Michael Miller [Catholic-Hierarchy]". Retrieved 1 April 2015. ^ "About Chapel of St. Basil". Archived from the original on 28 May 2007. Retrieved 26 March 2018. ^ "UST 2006-2007 Fact Book". Retrieved 26 March 2018. ^ "About the Library". Retrieved 1 April 2015. ^ HACU. "Hispanic Association of Colleges and Universities - HACU". Retrieved 1 April 2015. ^ "UNIVERSITY OF ST. THOMAS ANNOUNCES NCAA DIVISION III EXPLORATORY MEMBERSHIP". Retrieved 14 February 2018. ^ "Clubs & Organizations". Retrieved 26 March 2018. ^ "Campus News". Retrieved 1 April 2015. Wikimedia Commons has media related to University of St. Thomas (Texas). Kinder High School for the Performing and Visual Arts (HSPVA) was previously in the Neartown area. Neartown is within the Houston Community College service area, though no campuses are operated there. 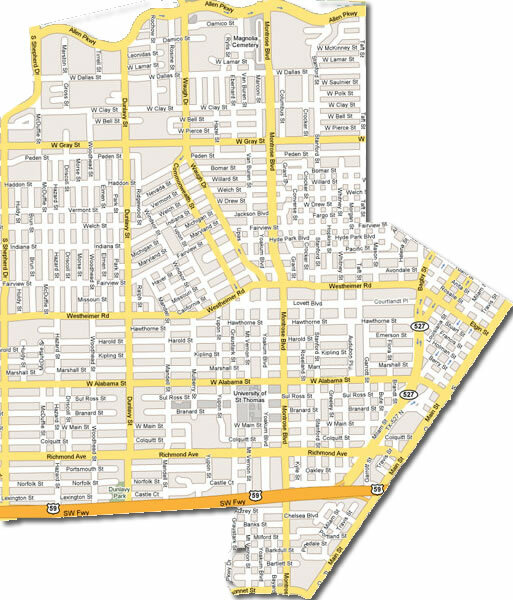 Within a section of the Neartown Association boundaries previously shown on its website are: the Houston Contemporary Arts Museum, the Administration/Glassel School buildings of the Museum of Fine Arts Houston (MFAH), First Presbyterian Church, and Presbyterian School. The current (as of 2019) map does not indicate any territory south of I-69/US-59 as being in Neartown.